Tangled in Aura, contemporary paintings by Michelle Ruvalcaba, opens at TONY COLLINS art + home, 1916 S. Lamar, Dallas, TX 75215, on Friday, July 16, 2010 with a reception from 5:00 pm – 8:00 pm. The exhibit remains on display through August 27, 2010. 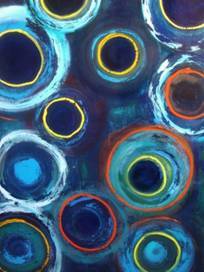 Ruvalcaba combines bold designs, vibrant colors and her signature high-gloss finish to create stunning works. Ruvalcaba currently lives and works in Dallas, Texas. TONY COLLINS art + home features the works of local artists along with furniture, home accessories, lighting and candles, made in their on-site studio by Tony Collins. Open Tuesday – Saturday, 11:00am – 6:00 pm, or by appointment, 214-565-1963.